For centuries, crystals like quartz, amethyst, and selenite have been thought to hold healing properties. A tradition that dates back to the Egyptians, today there are still plenty of people out there who visit their local rock shops for crystals that encourage positive vibes, good health and a peaceful state of mind. 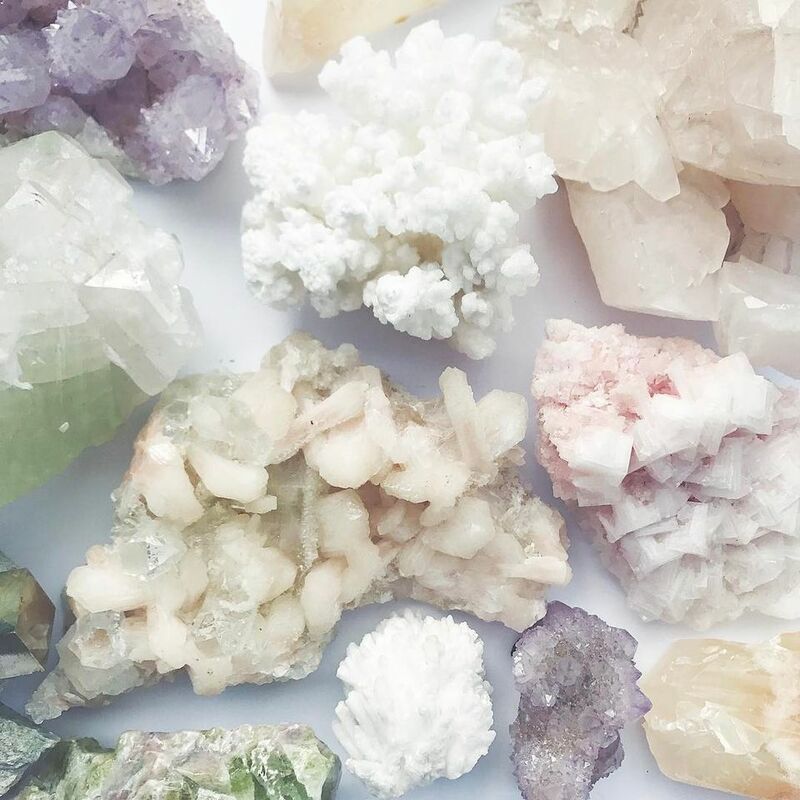 Mystical or not, crystals make for pretty décor, pops of color that lends a hint of nature to any space. It's an easy way to bring the outside in, and they satisfy any shiny object craving. Bonus? They're fairly inexpensive. A small piece of rose quartz typically won't be priced over $10. Also, you can put away that rock polisher. When it comes to crystals, the chunkier and more natural-looking, the better. Strive for imperfection–crystals that look as if you just happened to discover them on a hike. We won't tell anybody that you found them on eBay. Forget your memories of grade-school rock collections. Here are 10 stylish ways to display gemstones in your own home. Give your lighting an extra dose of radiance with a gemstone-encrusted lamp base, chandelier, sconce or pendant light. Some of these crystallized lights are investment pieces, but budget-friendly versions can also be found on Etsy and at Pier 1. For a free-spirited touch, add a single crystal to a fiber wall hanging or Dreamcatcher. Or if you'd like to channel your inner hippie, then add several multicolored crystals for a prismatic effect. Crystals, vintage books, and feathers come together to build an antiqued, well-loved vignette. A pastel palette sets a dreamy tone, adding whimsy to a nightstand or console table. An air plant growing on a crystal is a perfectly-pretty addition to your desk décor. It's a lovely way to be reminded of the outdoors, especially if you work in a cubicle. You can start your crystal garden by following a DIY on Pinterest or find a ready-made one on Etsy. A simple, pronged mount purchased at a hobby store, or even eBay can showcase a crystal and light up a shelf or window ledge. Display gemstones atop a stack of books, amid houseplants or alongside photo frames and mementos. Or arrange several together to create the look of a grown-up rock collection. If you have an empty fireplace and you’ve been searching for something beautiful to display in it, try a crystal sculpture that mimics a roaring fire. Purchasing a sculpture is likely less extravagant than refurbishing an entire fireplace. For an alternative to decorating with gemstones around your house, hang a painting or print instead, one that captures the sparkle and shine of crystals. Choose a neutral palette for more traditional surroundings or punched-up, technicolor hues for a real conversation starter. Spotlight geode or agate slices in shadow-box style frames and create a glimmering gallery wall. When crystals are sliced thin, at times, they tend to get nicked and may crack over time. The frames offer added protection for your treasures. Also, for an unexpected look, frame a mix of crystals in dark and light tones. Swap out those oh-so-basic drawer pulls for ones made of natural gemstones and brass. If you have a ho-hum dresser that you've picked up from a resale store, these are sure to add some much-needed glitz. They also serve as eye-catching details for bathroom cabinets. It seems appropriate when crystals festoon a jewelry box. Selenite and quartz look especially chic. You can always get out a trusty glue gun and try your hand at a DIY. Otherwise, Horchow, HomeGoods, and other retailers often carry bejeweled boxes.